The American Federation of Teachers is pressuring Pearson PLC, the global education company, to conduct a business strategy review with an eye to becoming more profitable. A resolution to that effect will be introduced at the company’s annual meeting in April, from an alliance of organizations representing 193,000 shares of the company, which has more than 821 million shares outstanding. The AFT has spent years fighting Pearson over high-stakes testing and other issues. Now, the 1.6 million-member union says the company should consider changes designed to ensure that the company makes more money, citing drops in its share price over the past year. But the union doesn’t want more high-stakes testing as a path to do so. The reason? More than two dozen AFT affiliates’ retirement funds hold Pearson shares. “AFT members hold Pearson stock mostly through their retirement and pension funds,” said Randi Weingarten, AFT president, in a statement released to EdWeek Market Brief this week. U.S.-based retirement funds connected to AFT affiliates with Pearson holdings are widespread: the union released a list of 27 affiliates that have holdings in the global education company, from CalSTRS (the California State Teachers’ Retirement System) to the Teachers Retirement System of the City of New York-Variable Funds, from the Arkansas Teacher Retirement System to the Colorado Public Employees Retirement Association. For whatever reason the retirement systems in the U.S. and elsewhere invested in Pearson—either because the stock is part of a fund investing in the FTSE 100 Index that includes Pearson, or intentionally—the fact is they now have a voice in the public company. Pearson questions the union’s approach. “Given that nearly half of our employees are educators and, as passionate advocates for teachers, we are surprised and disappointed at the AFT’s continued criticism of Pearson,” the company said in a statement it released March 17 in response to an inquiry from Market Brief. The escalating conflict that has been played out in dueling statements will get more discussion at the Council of Institutional Investors’ spring conference on March 22, when Weingarten will be one of four featured speakers in a Pearson Shareholder Forum. The AFT is not alone in the fight. Joining it is the National Education Association, which did not respond to requests for comment, and the Trade Union Fund Managers—which counts Great Britain’s National Union of Teachers among its members—as well as the UNISON Staff Pension Fund, which is based in the U.K., and 130 individual shareholders. The Chicago Teachers’ Pension Fund, which is connected to the Chicago Teachers Union, an AFT affiliate, led the charge in the initial announcement requesting the resolution. With a number of high-profile shareholders represented by the public protest, the coalition’s hope is that most will send in their proxies in favor of the resolution before the general meeting in late April. Over the years, the AFT has been a sharp critic of Pearson. In 2014, the union and has used the annual shareholders meeting to protest what it called a “gag order” on test questions. Last year, Weingarten went to that meeting to join with groups in demanding that Pearson “measure the social, emotional and academic impact of its education practices” in the United States, the United Kingdom and developing nations. Pearson’s most high-profile move in recent months was its announcement in January that it planned to cut 4,000 employees, or 10 percent of its workforce, saying its global strategy will now change to reduce the “geographic complexity” of the corporation, concentrating on fewer markets. The first shot fired by the coalition was a February announcement of its plan to submit the shareholders’ resolution. Pearson responded with a statement on March 7 to counter the announcement. Over the past few weeks, Pearson and the union have engaged in a protracted back-and-forth over this issue. Here’s a quick look at how the company has responded to the AFT’s assertion that Pearson’s current strategic business plan has failed to produce the profits, or the potential for profits, that investors need. 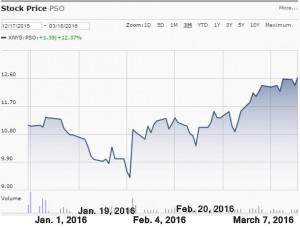 Pearson defends its overall business strategy. Pearson says its strategy is promising, quoting several analysts on favorable comments the AFT ignored, and an analyst from Citi that questioned the criticism leveled at Pearson. Analysts from several firms, including Barclays and Credit Suisse, were “unimpressed with the scope and depth” of Pearson’s review, the union said in its March 10 statement. The plan is focused on a “drastic cost-cutting exercise designed to buy CEO John Fallon more time to calm the market,” the AFT said. 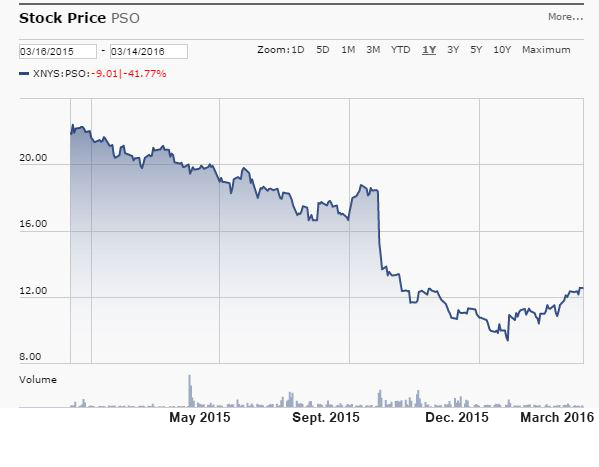 Pearson argues its diminished share price is not as bad as it seems. Pearson refuted the claim that the Every Student Succeeds Act is proof that assessments are in decline in the U.S., posing a threat to the company. ESSA does not eliminate assessments. It maintains the federal testing requirement, Pearson wrote, but provides states with greater flexibility in how they use the results of those tests. School rating systems will now use students’ proficiency on tests as only one indicator for ratings; another indicator will be student academic growth, and a non-test-based measure of student success or school quality. Besides pointing out that ESSA prohibits the federal government from advocating or suggesting a core curriculum, “which means the products and assessments developed for the Common Core standards will no longer be required in many states,” the AFT said that ESSA allows states to use funds to end existing testing procurement contracts. Pearson rejects the idea that its business is too reliant on assessments in the U.S. The union further stated that the nature of high-stakes testing “requires an obsession with test security” that has led to the monitoring of students’ social media accounts and contractual gag orders for teachers and schools, which the union said eroded trust, Pearson’s brand, and its bottom line. The next step in the fight is the Pearson session during the convening of the Council of Institutional Investors. “As co-owners of the company, our members want to see a different approach,” Weingarten said at the end of her statement this week. How about divesting? Seems like there must be significant conflict of interest between demands for greater profitability for Pearson and concerns about the textbook company’s approaches to expand its role in higher ed. Unions blast education management companies for “using public charter schools to make a profit.” But apparently it is acceptable for Pearson to do so because they benefit. Is this a legal relationship: AFT investing with Pearson, the author of major public school assessments? A lot of questions have been answered for me, like “Why were tests always changing when students were most successful?” New and harder/changed test questions implies more production of new tests and …of course more money! Did I see this in the past Sec.of Educ.,Rod Paige’s book?